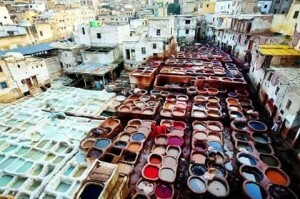 Upon arrival to Fes, your guide will meet you and take you to dinner to your Riad in the heart of the medina. Around 8:00 you can start to visit the spiritual capital of Morocco. In the morning we will visit the old medina , the Royal Palace (even if only), the Mellah (Jewish quarter), Bab Boujloud entrance. You can then explore el-Bali, the greater medina (and mess) from all over Morocco, and madrasa (Koranic school) of the 17th century, etc, then you will have the opportunity to have lunch in a traditional Moroccan restaurant where you can taste the typical dishes of the region. In the afternoon, visit of Fes continue. In the morning departure to the mausoleum of Moulay Idris, the founder of Fes in the sixth century. On the way we will visit the magnificent roman ruins of Volubilis. Then we continue our journey to Meknes and once there we will visit the mausoleum of Moulay Ismail (ancestor of the current King Mohammed VI of Morocco) and the royal palace, and the enormous Elhdim up to the gates of the city, Bab Mansour, dinner and before you go to sleep. Starting at 8:00 am, in the Sahara desert. We crossed the Middle Atlas mountains and’ll stop in apes Barbay, well known for their hospitality. You can also stop taking photographs of the beautiful landscape. We will have lunch at a restaurant in Errachida before continuing the journey in the Ziz valley and reach the foot of the dunes of Erg Chebbi 1700. 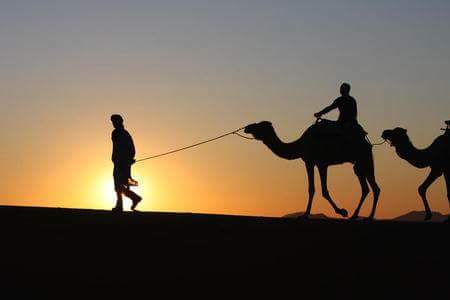 From there you can go on a camel in the desert until the camp located in the heart of the dunes. Enjoy a mint tea and the sunset and Berber music. 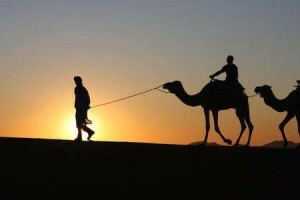 Night, you can take a walk and enjoy the stillness and silence of the desert, before going to sleep in a tent Berber. Up to 5:00 to climb the dunes and admire the majestic sunrise over the dunes. Then you can take a council at their disposal to test the “sand-boarding” on the slopes of the dunes. After breakfast, you will be transferred to an inn where showers are at your disposal. Then we make our way toward Erfoud, where you can visit a fossil site. We continue toward the west and the Todhra Gorges du. 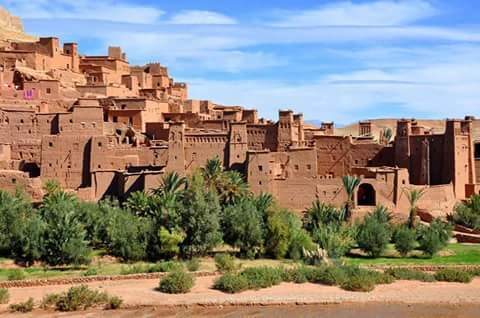 We’re going to visit the City of Roses, before arriving to Ouarzazate for dinner and spend the night in a Kasbah. After breakfast, visit the Atlas Studios, known worldwide as the kasbah Taorirt which was the residence of the Glaoui family. Then we continue the way toward Marrakech through the High Atlas Mountains (you can stop to take pictures of the splendid panoramas). Then visit the Kasbah of Ait Ben Hadou, Telouet … Before arriving at night in Marrakech. 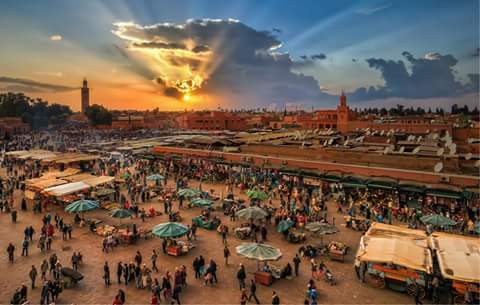 Visit of Marrakech, the “pearl of the south”. You’ll discover the Palace of the Bay, the Saadian tombs of the kings and other treasures. After lunch you can enjoy the magnificent Koutoubia mosque and complete the visit with a tour through the streets of the souk in Marrakech.